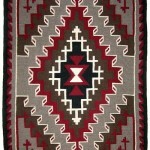 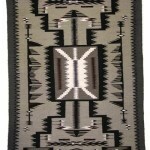 This newly handwoven Ganado pattern Navajo rug is 100% wool. 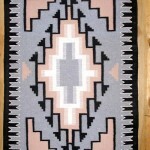 The weaver, Nellie Wagner of Kearns Canyon Az, is a member of the Navajo Rug Weavers Association, and the rug includes the Navajo Rug Weavers Association Certificate of Genuineness. 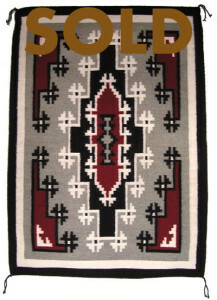 Ganado emerged as one of the original regional style centers during the Rug Period 1890-1920, and is often thought of as the classic Navajo rug. 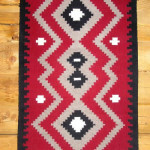 An uncomplicated geometric design theme dominated by the serrate, or stair-stepped diamond, on a beautifully dark red background, characterizes the Ganado. 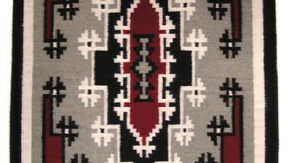 In some pieces one diamond is drawn out from end to end, as in this weave; in others, three adjoining or interlocking diamonds fill most of the space. 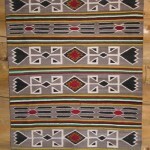 Ganado rug colors are traditionally red, black, gray and white, usually with a border of black or red.